There was a new announcement from LIGO, the Laser Interferometer Gravitational-Wave Observatory, recently. Gravitational waves were first predicted by Einstein. They’re ripples in the fabric of space that move at the speed of light, created by huge events - like colliding stars or black holes. Despite the magnitude of these events, Einstein thought it would impossible to observe them. However, 100 years later, scientists did find them. Two black holes collided, creating gravitation waves that were picked up by LIGO. This week, they announced a fifth detection. But this one is different, as Astronomer Royal, Professor Lord Martin Rees explained to Graihagh Jackson. Martin - Well is more interesting because, in this case, what was colliding was not two black holes but two neutron stars. Neutron stars are stars that weigh a bit more than the Sun but are only about ten miles across, so very very dense. They collide and splash together rather like two black holes do. But when black holes collide, you don’t see anything else because a black hole is, essentially, just much curved space. When two neutron stars collide, you expect to see a lot of evidence for this collision in other ways: optical light, X rays, etc. What is exciting about this event is that they detected the gravitational wave from the merger but, less than two seconds afterwards, a gamma ray flash was detected from the same object. Since that time, about 70 different observatories have been looking at the afterglow from this event to try to understand what’s actually going on, and it’s very complicated physics. The announcement was made last Monday and the lead paper has 3,000 authors which is, I think, a record at least for astronomy, and those are the 1300 authors involved in the LIGO experiment and the gravitational wave experiment called VIRGO in Italy. Plus also the many hundreds involved in the other observatories which have looked in all other wavebands for evidence of this follow-up. They’ve been observing this object, which is in a galaxy about 100 million light years away for the last couple of months - it was actually detected on August 17th. Graihagh - And it’s lovely that after the Nobel’s have been awarded for this detection that we’re now seeing another great breakthrough in this area. You said that there were other types of electromagnetics light: x-rays, gamma rays that were detected, but we were expecting it to see a few others and we didn’t, like ice cube in the Antarctic for instance? Martin - We didn’t see neutrinos and what we’re trying to do now is to do more detailed calculations to see how surprising it is. Because the reason that this is such an interesting event is that we only have theoretical ideas as to what happens in the very extreme physics that happens when two of these neutron stars crash together, merge, and then collapse into a black hole within a fraction of a second. It’s very exotic physics and only now are we really getting some data which allow us to firm up our ideas and, as you say, we haven’t seen it in neutrinos. We’ve seen it in x-rays and we’ve seen it in light, starting off blue and then getting red. This is very interesting because there have been some ideas that these colliding neutron stars are very important for something which affects us all on Earth. It’s thought that events like this that created most of the gold in the universe. Gold is a very heavy atom, of course, and it can’t be made by the processes in stars that make most of the rest of the periodic table. So it’s been speculated that gold is one of the elements that are made in these exotic events, and these events happen about once every 100 thousand years in each galaxy. And we are for the first time observing one and we’ll be able to check whether this idea is correct by looking directly at whether the kind of light is what you would expect if it was producing the conditions for the gold to be made. Graihagh - I suppose that explains that’s why it’s so rare and valued here on Earth. Now I know that at the initial detection back in 2015 that astronomers claimed that gravitational waves could be used as another window onto the universe and you alluded to it in your answer there. I wonder, is that the beginning of this or can we already say something new about the universe that we didn’t know before? Martin - I think it’s important to know that gravitational waves exist because it’s been the firmest evidence that Einstein’s theory is right even when the gravitational fields are very strong. It’s been a great vindication of ideas about gravitational waves and black holes. But this object, I think, that was observed in August is especially interesting because it tells us not just about gravity, but about other kinds of physics. It tells us about how atoms and nuclei and magnetic fields behave under these extreme conditions, and tells us more about neutron stars. I should say that it’s 50 years ago that neutron stars were themselves discovered. They were discovered in Cambridge by Joselyn Bell who, in July 1967, discovered a very strange beeping radio source in the sky which was realised, within a few months, to be a spinning neutron star with a sort of lighthouse beam that passed through our line of sight once every revolution, and that was a pulsar, the first neutron star to be discovered. Since that time we’ve found thousands of neutron stars, some live in binary systems. We have expected that there should be some cases when these binary neutron stars get closer and closer as they use gravitational radiation and then eventually crash together, so this event has been expected. 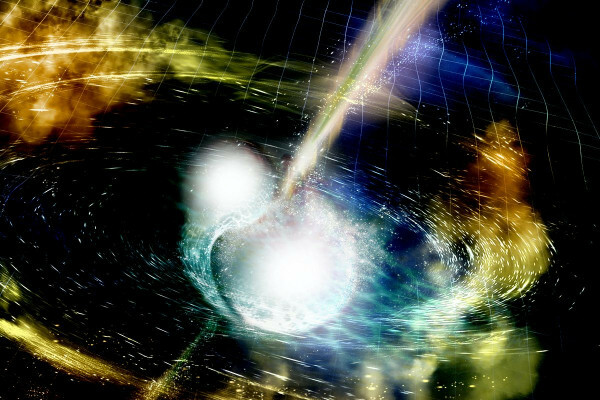 We didn’t know how many there would be and it was rather surprising to many people that the first gravitational wave event to be detected was actually two black holes and not two neutron stars and, in a sense therefore, this was an expected discovery. But it’s an amazing technical achievement and it’s a contrast to 50 years ago when the discovery of neutron stars themselves was completely unexpected. Graihagh - And it’s lovely that after the Nobel’s have been awarded for this detection that we’re now seeing another great breakthrough in this area. You said that there were other types of electromagnetic light: x-rays, gamma rays that were detected, but we were expecting it to see a few others and we didn’t, like ice cube in the Antarctic for instance? I should say that it’s 50 years ago that neutron stars were themselves discovered. They were discovered in Cambridge by Jocelyn Bell who, in July 1967, discovered a very strange beeping radio source in the sky which was realised, within a few months, to be a spinning neutron star with a sort of lighthouse beam that passed through our line of sight once every revolution, and that was a pulsar, the first neutron star to be discovered. Next Is AI worth the risk?